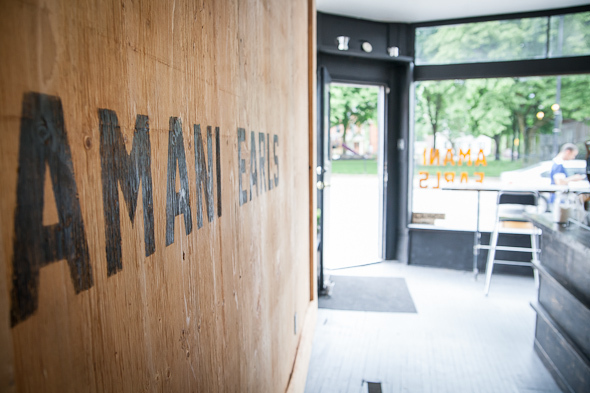 Amani Earls is an adorable mom-and-pop coffee shop that just landed in the Junction last week. The building is noticeable from down the street because of the kitschy old ad for "John's Colour TV" on its brick side. Owner Justin McMillin greets me with a huge smile as soon as I walk in. He chats me up, telling me he's been in the coffee business for a long time, so he and his fiancé, Tiffany, felt they were in a good place to open their own shop. The space is really simple, stripped down, and relaxed, with bluesey tunes floating softly out onto the sidewalk. One wall is made of reclaimed wood from the space as it was before (it used to be a TV repair shop. So retro). McMillin built the wall himself, as well as the bar. The opposite wall is cozy, crumbley red brick, and there are photos by local artists lining the nook-type space in the back. 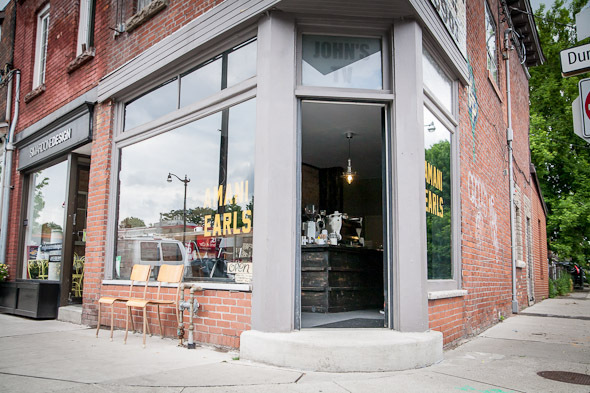 The DIY efforts of McMillin and his fiance (they even stamp the paper bags for takeout treats) stop Amani Earls from being just another coffee shop with an exposed brick wall and turn it into something much more inviting. Drinks on offer include espressos ($2.50), Americanos ($2.75), lattes ($3.75), cappuccinos ($3.25) and macchiatos ($3.25), as well as a good selection of teas (lemon peppermint iced tea will soon be available. I drool at the prospect). 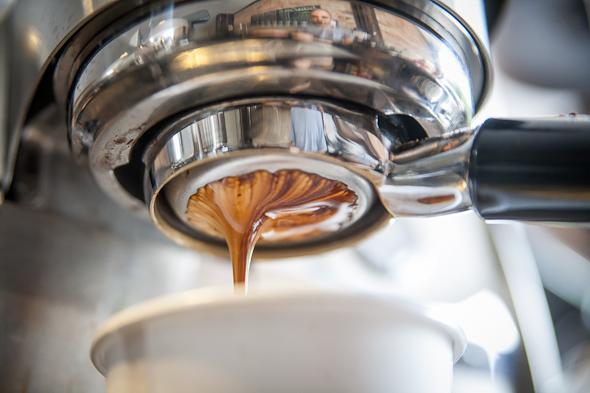 Drinks are made using a Synesso espresso machine (affectionately dubbed a "Rolls Royce" by McMillin), and beans from local roasters, Pilot (formerly Te Aro Coffee Roasters ). He also offers up a special drink for the sweet-toothed called the Honey Black, which is basically a cortado with a ton of honey in it. Not brave enough to stomach the Honey Black, I opt for a latte. The foam finish is slightly on the dry side (think big bubbles), and but it's still quite good. The coffee is rich and deeply flavoured, without being bitter. 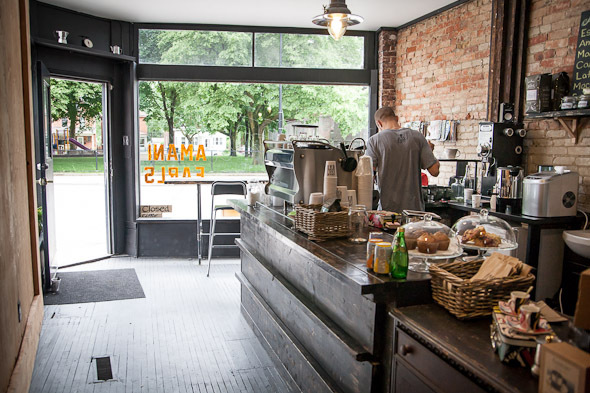 McMillin knows the Toronto coffee scene inside out. He's worked with the folks at Crema and TAN , among others. He doesn't do drip coffee, as he feels it can cheapen the caffination experience. 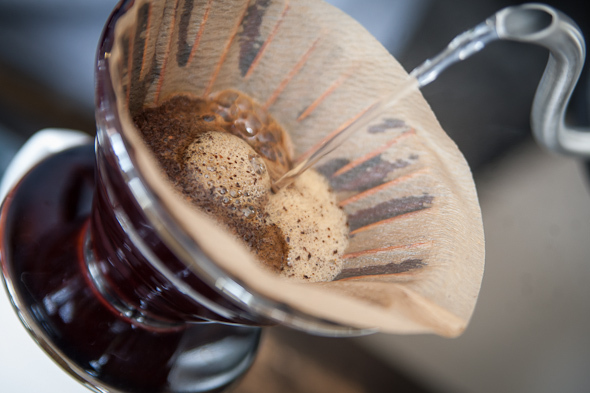 "I just don't want to offer stale drip coffee. 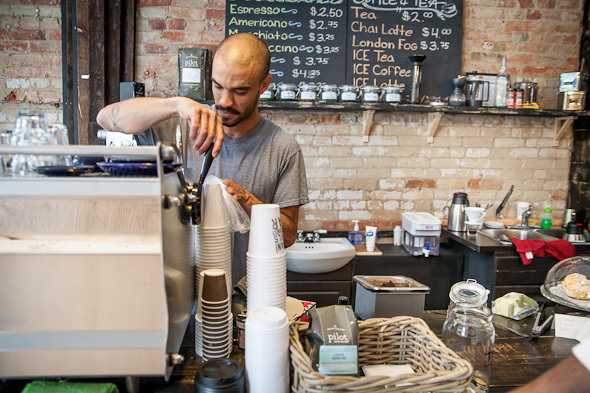 I wanted to allow the coffee to be front-and-centre," he says. The shop seats nine, with communal seating in the back, and a long table at the window overlooking the street. Right now, McMillin is still working out a few kinks in the whole operation. His ice machine wasn't fully up and running when I dropped in, which sadly made iced Americanos and cappuccinos an impossibility on a warm and sunny afternoon. That's set to change very soon, though, as he plans to bring in a cold-drip brewing machine. He's also not sure if he plans to provide WiFi yet. Because the space is so small, he's concerned about people ordering a coffee and hoarding the limited space. 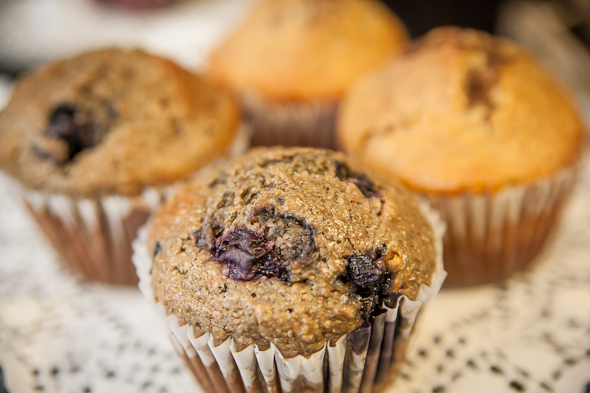 The treats selection is also pretty limited at this point, consisting of muffins and scones and scone/rusk hybrids. But he plans to serve grilled cheese and some vegan snacks in the near future. Despite the few early-start hiccups, I can see this spot doing really well — a dude comes in while I'm visiting to grab an espresso, and tells McMillin that he plays with his son in the park across the street and has always thought there should be a coffee shop here. The tunes are relaxing, there's breeze blowing in the open door and the coffee holds its own — I could probably camp out here all day.